Accurate information on the spatial distribution and temporal change of wetlands is vital to devise effective measures for their protection. This study uses satellite images in 1994 and 2001 to assess the effects of topography and proximity to channels on wetland change in Maduo County on the Qinghai-Tibet Plateau, western China. In 1994 wetlands in the study area extended over 6,780.0 km2. They were distributed widely throughout the county, with a higher concentration in the south, and were especially prominent close to streams. The pattern of wetlands demonstrated a bell-shaped distribution curve with elevation, ranging over hill slopes with gradients from 0–19°, the commonest gradient being around 3°. Although the aspects of these hill slopes range over all directions, there is a lower concentration of wetlands facing east and southeast. The extent of wetlands in 2001 decreased to 6,181.1 km2. Marked spatial differentiation in the pattern of wetlands is evident, as their area increased by 1,193.3 km2 at lower elevations but decreased by 1,792.2 km2 at higher ground, resulting in a net decrease of 598.8 km2. In areas with a gradient <2° or >9° the area of wetlands remained approximately consistent from 1994–2001. Newly retained wetlands are situated in relatively flat lowland areas, with no evident preference in terms of aspect. Wetlands on north-, east- and northeast-facing hillslopes with a bearing of 1–86° were more prone to loss of area than other orientations. 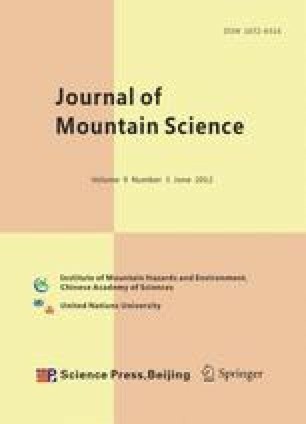 The altered pattern of wetland distribution from higher to lower elevation on north-facing slopes coincided with the doubling of annual temperature during the same period, suggesting that climate warming could be an important cause.